It can be really annoying when you need to loosen a few nuts and bolts but you need to bring along multiple tools to do the job. If you are looking for a single tool that will work with all nuts and bolts that you have in your home then the 1 Second Socket™ is the product that you should be using. As seen on www.1secondsocket.com, 1 Second Socket features a revolutionary design that allows it to work with virtually all sizes of nuts and bolts in your home. The product's working tip features retractable steel rods inside. 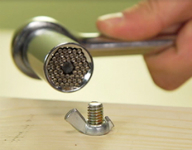 As you push the socket head onto the nut or bolt that you will be working on, they will in turn push the steel rods that they come into contact with while the ones that do not get pushed in grip around the nut or bolt, allowing you to tighten or loosen them as needed. Also, what's great about the 1 Second Socket is that it can handle over 140 pounds of torque which means that it can be useful for the different bolts that you have installed in your home. Thanks to how versatile the 1 Second Socket is, you will not need to bring as many tools along with you when going around your home to do maintenance work. Use the links below to find the best offer on 1 Second Socket™.